Here at Hippie Snacks, we encourage you to eat fresh fruits and veggies whenever possible, ‘cuz why not? 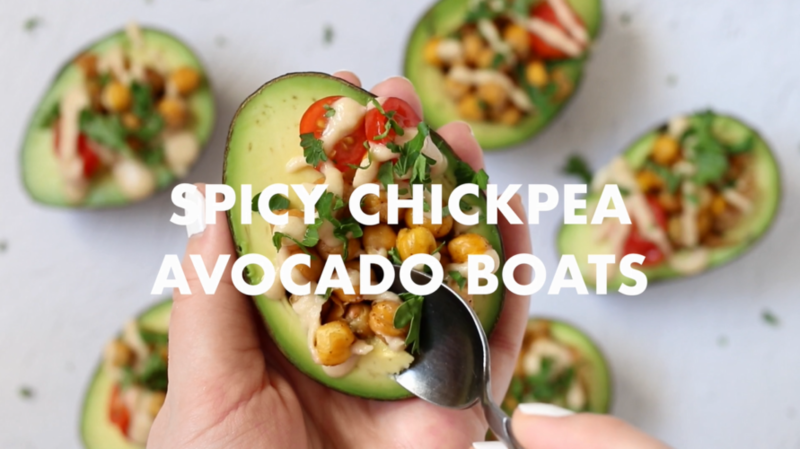 Here’s an easy way to spice up your avocado game (literally) and even eat your avo a little differently, say, in a boat. In a medium size bowl, mix together all spicy chickpea ingredients then place on baking sheet. Place in oven for 30 minutes, stirring half way through. In a small bowl, whisk together tahini dressing ingredients. Slice avocadoes and remove seeds. Add cooked chickpeas, cherry tomatoes, tahini dressing and garnish with parsley.